100% Linen Embroidered in the U.S.A.
NEST FRAGRANCES Candles made with premium wax and the finest fragrance oils. GiftCard A DEWOOLFSON Gift Card is the perfect gift for that oh−so−dear, yet hard−to−buy−for person in your life. You decide the amount and we will email them the wonderful news inside a lovely card. Simple & sincere. GiftRegistry Create your Gift Registry at dewoolfsonlinens.com – the perfect and easy way to create a wish list for yourself or someone else. natural. comfortable. home. 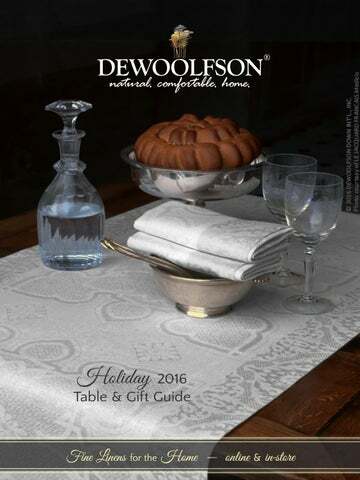 DEWOOLFSON LINENS 9452 NC Highway 105 Banner Elk, NC 28604 U.S.A.
© 2016 DEWOOLFSON DOWN INT’L., INC.